Dhumavati is one of the Mahavidyas, a group of ten Tantric goddesses. 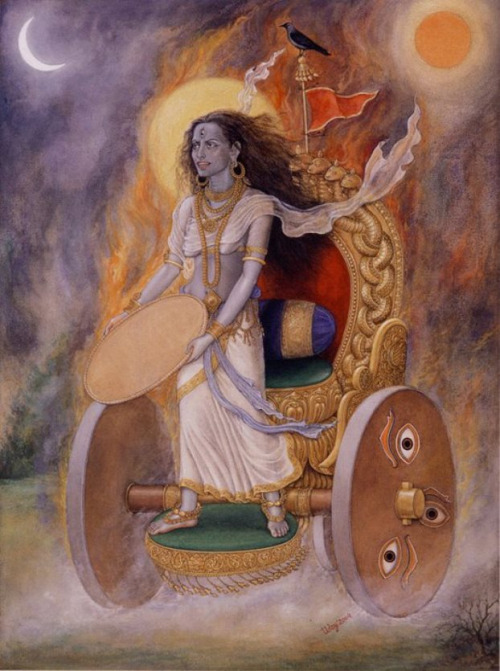 Dhumavati represents the fearsome aspect of Devi, the Hindu Divine Mother. She is old and found sulking. She is the only Mahavidya without a consort. She is a widow associated with strife, loneliness, unfulfilled desires and inauspicious things of life. Dhumavati shares some of her characteristics with three other ancient goddesses – Nirriti, Jyeshta and Alakshmi – who personified disorder, decay, poverty, misfortune, dissension, sickness, and the whole range of life’s ills, culminating in death. There are similarities between Dhumavati and the above three goddesses. There are also differences. 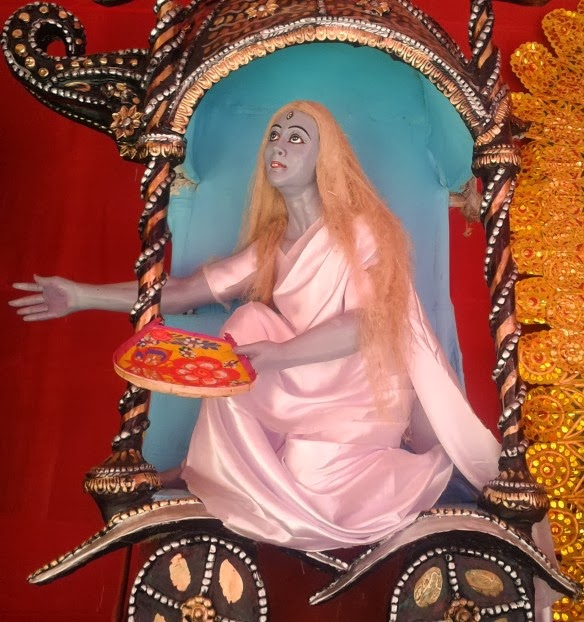 Unlike those goddesses, Dhumavati is a widow; she is ugly and old. Dhumavati is also said to be fierce, frightening and fond of blood. She has, however, certain positive characteristics such as: guiding the devotee along the spiritual path to help him/her attain liberation; granting Siddihis and rescuing her devotees from troubles. Dhumavati is worshipped by the Tantrics for the attainment of Siddhis (magical powers). 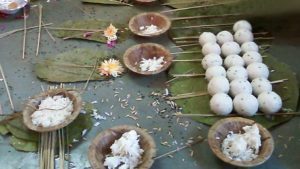 Though Dhumavati’s worship is considered ideal for bachelors, widows, Sanyasins and Tantrics, the householder too flock her seeking blessings and fulfillment of their desires. Dhumavati Tantra describes her as an old and ugly widow. She is thin, tall, unhealthy, and has a pale complexion. She is described as being restless and wicked. She does not have jewelry and is seen wearing old clothes and is seen with disheveled hair. Her eyes are fearsome, her nose long and crooked, and some of her long fang-like teeth have fallen out, leaving her smile with gaps. Her ears are ugly and rough; her breasts hang down. Her symbolic representation suggests that she represents negative things in life. In the Prapancasarasara-samgraha, Dhumavati is described as having a black complexion and wearing ornaments made of snakes. Her dress is made of rags taken from cremation grounds. She holds a spear and a skull-cup (kapala) in her two hands. The spear is sometimes replaced by a sword. Another description in the same text says Dhumavati is aged with a wrinkled, angry face and cloud-like complexion. Her nose, eyes, and throat resemble that of a crow’s. She holds a broom, a winnowing fan, a torch, and a club. She is cruel and frowning. Her hair appears disheveled and she wears the simple clothes of a beggar. Her breasts are dry. Her hair is grey, her teeth crooked and missing, and her clothes old and worn. There are also unusual descriptions of Dhumavati where she is shown as a good-looking young woman full of life with attractive features. She is not a widow. She is holding a winnowing basket while riding a huge crow. She is adorned with ornaments, bracelets, arm-bands, necklaces, and pendants. She is elegantly dressed. Her appearance here is in total contrast to the descriptions of her as ugly and old wearing soiled rags. Dhumavati is often named as the seventh Mahavidya. The Guhyatiguhya-Tantra equates Vishnu‘s ten avatars with the ten Mahavidyas. The fish incarnation Matsyais described as arising from Dhumavati. A similar list in the Mundamala equates Dhumavati with Vamana. According to the Shakta Maha-Bhagavata Purana, which narrates the creation of all the Mahavidyas, Sati, the daughter of Daksha and first wife of god Shiva, feels insulted that she and Shiva are not invited to Daksha’s yagna (“fire sacrifice”) and insists on going there, despite Shiva’s protests. After futile attempts to convince Shiva, the enraged Sati transforms into the Mahavidyas, who surround Shiva from the ten cardinal directions. Dhumavati stands in the south-east. Another similar legend replaces Sati with Kali (the chief Mahavidya) as the wife of Shiva and origin of the other Mahavidyas. The Devi Bhagavata Purana mentions the Mahavidyas as war-companions and forms of goddess Shakambhari. The Pranatosini-Tantra version stresses Dhumavati’s destructive aspect and hunger, which is satisfied only when she consumes Shiva, who himself contains or creates the universe. It brings out her inauspicious status as a widow and her self-assertion on her husband. 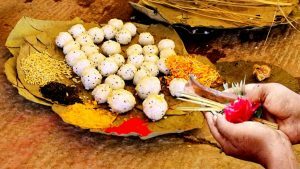 Dhumavati Jayanti Maa Dhumavati Pooja Stories and Legends of Diwali Festival – Part II Why do we offer food as prasadam to God? ஏன் நாம் உணவை இறைவனுக்கு பிரசாதமாக படைக்கின்றோம்?